The giant moray (Gymnothorax javanicus), also referred to as Puhi in Maori langage is the most massive moray eel in the polynesian waters. It only has few predators due to its size, indeed it can measures 5ft and 55lbs. The moray is referred to as such precisely because at the end of the 2nd century before Christ the Roman Licinuis Muraena kept this curious creature in his residence with the aim of showing it to his guests as proof of his richness. 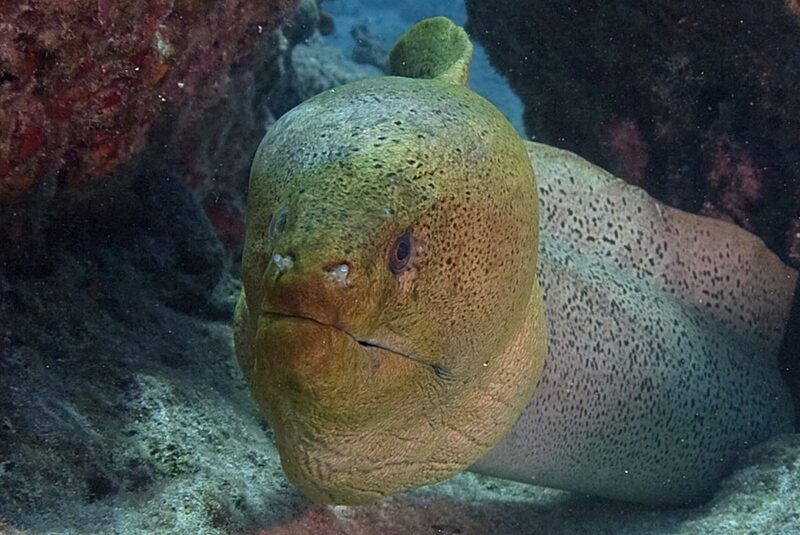 The giant moray has a brown thick and smooth skin with green shades on the head. We can notice its two gill holes circled in black. It is a formidable predator that owns a row of long and razor-sharp teeth. The giant moray is a solitary species living until 50m depth in crevices of corals in lagoons or on oceanic slopes. The moray is a more or less sedentary animal that owns a territory extended to hundreds of meters or even kilometers. It doesn’t hesitate to leave its hiding place of coral to hunt vulnerable preys detected in the sea. The giant moray plays an important ecological role in the balance of the seabed by feeding on these weakened fish, crabs or octopus. Because of its bad eyesight the moray uses essentially its highly developed sense of smell to track down its preys mainly at night. As a weapon, the moray has a menacing dentition with the two longer teeth installed in the middle of the palate like two hooks. This dentition causes deep wounds that allow the passage of its venomous salivary secretion. Last but not least, the giant moray seems to own a second jaw (a pharyngeal jaw) located in the back of the throat that is used to carry foods directly in the digestive tract. It has developed this second jaw because it can’t swallow foods in its uncomfortable position within the coral. 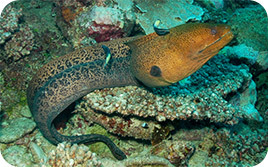 The giant moray may live up to 25 years. It is an hermaphrodite species: it is born male and will become female later. We lack information on its reproduction, but we know that the giant moray lays eggs that give rise to small translucent larvae. Each little will become sexually mature after two years of growth. You could observe this impressive moray by diving into all the archipelagos of French Polynesia. This species is commonly inoffensive but very bold approaching divers just out of curiosity. Besides, that behavior will increase your chances to see it.